Schone en bijgewerkte hut met 3 slaapkamers en 2 badkamers op een afgelegen baai. Gloednieuwe A / C-eenheid augustus 2018, zwemmen, vissen, kanoën of paddle-board in de achtertuin. Koning in slaapkamer, koning in de tweede slaapkamer en twee tweepersoonsbedden in de 3e slaapkamer. 2 volledige woonruimtes met tv's, dvd-spelers en schotelkabel, complete keukenopstelling met alle benodigde items om uw ontbijt, lunch of diner te maken. BBQ Grill met volledige propaantank op achterportiek. Omwikkel dek om in de ochtend te genieten van uw koffie en cocktails. Op loopafstand van het heerlijk ontbijt in het Landing restaurant en diner in het Mexicaanse restaurant Los Arcos. De cabine ligt in een rustige wijk aan de doodlopende weg met heel weinig verkeer. Kom en ervaar een klein stukje van de hemel. Boten kunnen wel of niet in staat zijn om terug te keren in de baai op basis van de waterstanden elke dag. Niet roken binnen, geen huisdieren alstublieft. Bedankt! Het is het beste om niet 2 douches tegelijk te nemen vanwege de beperkte waterdruk. The house was great. Definitely would return. The lake house is very inviting. Unfortunately, we did not get to enjoy the back deck due to weather. We were in the area to visit family; so, this was not a huge concern for us. The beds were comfortable. We did use the kitchen minimally since we were not at the house a lot, but it had all the amenities one would want if making meals. Water pressure in the showers is not a problem, an area i think is most important. However, it is lacking at the sink faucets. Overall we nad a great stay and will consider the same property when we are in the area again. Tranquil & Relaxing spot by the lake. Our stay was tranquil & relaxing by the lake spending time with family nearby for Thanksging. We loved the two separate seating areas, where everyone could divide up and have different conversations. We came to see family nearby and the cabin was our hub for entertaining. We had 17 during the day and 8 staying at night and the vrbo spot was perfect. The full back porch was one of my favorite things, Coffee in the mornings while all was quiet was especially nice.. The kids enjoyed fishing, a bonfire down by lake and plenty of room to play ball. The owners Stephen & Jill were excellent to work with and they provided extra special touches thru out the house. Quick to respond to questions and very informative about the area. Kitchen was fully stocked for us to make our big thanksgiving meal, we just had to bring the food. The fire place was not useable, because it hadn’t been cleaned for the season yet, so that was a bit disappointing, however having a bonfire by the lake made up for that. Sitting in both areas was very comfortable lounging furniture, all our guys especially liked while watching football. I highly recommend this spot if you are looking for tranquil, relaxation. There is no WiFi, and what I loved about it is the kids/adults just set their phones away and enjoyed just laughing & playing games. Thank you for a great home away from home. We are so glad you all enjoyed your time away with family at our lake house over the Thanksgiving holiday! Please keep us in mind for any future travels to lake Eufaula. We do apologize for the fireplace not being functional, for your use. We will get that taken care of. Have a wonderful holiday season, and a very Merry Christmas. Met our needs for a small family reunion. We had a small family reunion of siblings. This property met the needs of six adults. The different seating areas provided plenty of opportunities for conversation. The campfire area is nicely situated down by the shore. The owners are very easy to communicate with and respond quickly to any of our questions. 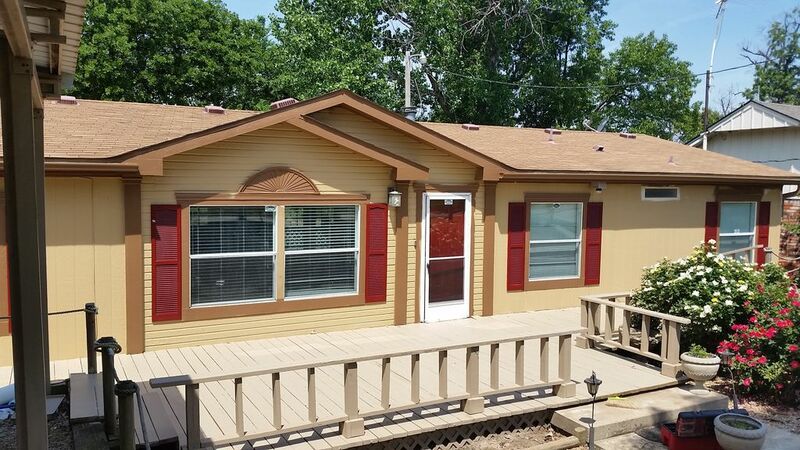 Overall we highly recommend this property for a stay in the Lake Eufaula area. Neighborhood was nice , location was awesome, there’s a canoe but the paddles and other fun stuff is all locked up? The home was beautiful, comfortable, and perfect for our needs. Early morning coffee on the deck was so relaxing. Awesome lake views with plenty of birds and squirrels to entertain 5 old ladies. Despite sweltering heat outdoors, we stayed comfy cool inside. I strongly recommend this home if you want a quiet, relaxing getaway. We will likely come again.. Thank you for your review, we are glad your group enjoyed your time at our lake house. Since your stay we have completely replaced the a/c unit and the house should be much more comfortable for your future stay. Onroerend goed is gelegen in Longtown, OK voor geschatte afstand tot andere gebieden of lokale steden.